Patricia Griffith on course with Lexi Maounis' Platinum in Saturday's $5,000 Devoucoux Hunter Prix at HITS-on-the-Hudson in Saugerties, New York. 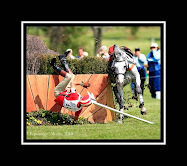 SAUGERTIES, NEW YORK (June 12, 2011) — Patricia Griffith made the most of her time at HITS-on-the-Hudson this week when she took first and second place against a field of 61 starters in Saturday's $5,000 Devoucoux Hunter Prix. She finished first aboard Platinum and second aboard Sienna, both owned by Lexi Maounis. Griffith had two horses in the second round, which saw the top 12 with the highest scores from the first round return. She showed first aboard Sienna and took over the lead, previously held by Jenny Fischer and Stormy Good’s Freedom’s Storm. Fischer and Freedom's Storm, the winners of last week’s $5,000 Devoucoux Hunter Prix, finished third in the ribbons this week. 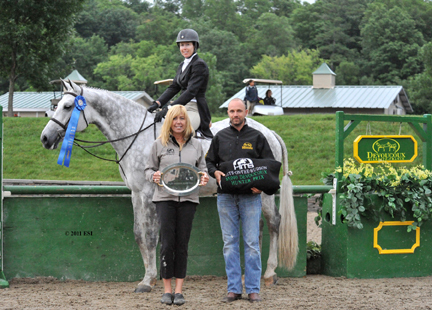 HITS’ Lisa Engel is joined by Guillaume Jullienne of Devoucoux to present the awards to Patricia Griffith and Platinum after their win in Saturday's $5,000 Devoucoux Hunter Prix in Saugerties, New York. Rounding out the top five in the class was David Oliynyk of Plainville, Massachusetts aboard Lori Gaudet’s Generous in fourth place and Lillie Keenan of New York, New York aboard Don Stewart’s Confidential in fifth place. 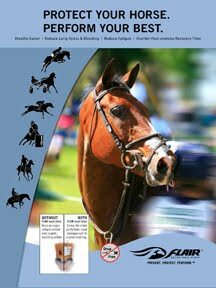 The Devoucoux Hunter Prix will return this summer at HITS Culpeper (July 6 – 17) and will feature two events. 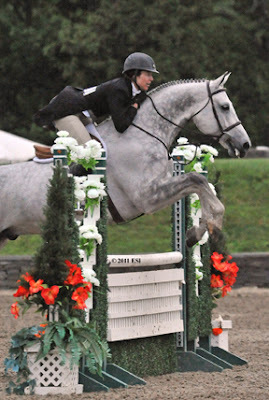 The HITS-on-the-Hudson Summer Series returns to Saugerties on July 20 for three consecutive weeks and will feature three crucial qualifiers, as riders eagerly compete for points in order to qualify for the Diamond Mills $500,000 Hunter Prix Final, which takes place on Saturday and Sunday, September 10-11 at HITS-on-the-Hudson.